New Formulation now with surfactant! Water soluble dry granules in pre-measured 1.5 ounce packs. 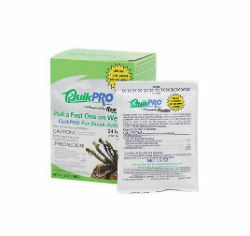 QUIK-PRO™ DRY contains the proven killing power of Glyphosate, in its strongest solution ever at 73.3%. Roundup® Quik-Pro™ also contains 2.9% Diquat. Quick death to unwanted weeds & grasses. Each 1.5 oz. packet contains enough herbicide for one gallon of spray solution for control of annual and perennial weeds. Use in pump-up or backpack sprayer. This systemic herbicide mixes easily with water to be applied as a foliar spray for control of labeled broadleaf and grassy weeds such as crabgrass, thistle, and quickgrass. Also can be used for control of woody brush and trees, roots and all.